I’ve been coaching for close to 20 years now (I’m officially in my 19th year), and one thing I’ve learned over the years is that trainers and coaches love learning stuff they can use and apply immediately. If you go to a workshop, it’s called “Monday Morning” value. Sure they want to learn theory and philosophy – stuff that will reshape how they train and coach for a lifetime. But if you can learn something useful that you can immediately apply? All the better! Now when it comes to core training, I’ve written more than a few articles (and shot more than a few videos) along the way. In fact I’d imagine if you counted up all the coaching videos I’ve recorded, plus all the core training articles I’ve written, and maybe even throw in the Complete Core Training product I developed, there would literally be hundreds of pieces of core training content from yours truly. But here’s the thing – my approach is always evolving. At the end of the day, you need to find a blend of choosing the right exercises and coaching them the right way to get the most bang for your core training buck. So in this article, we’re going to cover a ton of ground – but most importantly, we’re going to focus on those little wins you can start using right now, today, to take your core training game to the next level. The dead bug has been a staple in my core training programs for years. 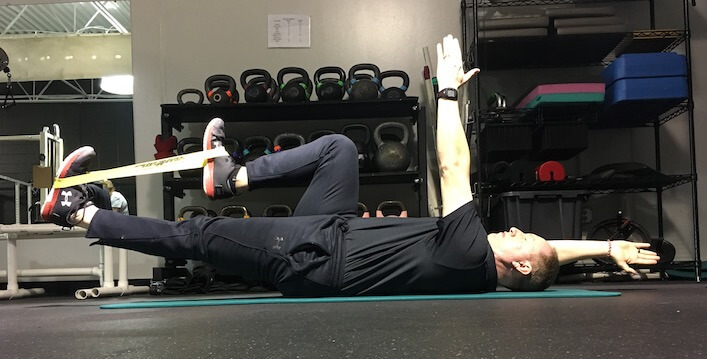 Not only are their tons of progressions and regressions involved, but it’s one of the easiest exercises I know to get a client or athlete to “feel” their abs. In this video, I break down not only how to do the exercise, but give you a ton of variations to play around with as well. However, some people just don’t like planks for whatever reason, and that’s totally cool. In that case, I really love using the bear progression instead. Walking bear (where we make it dynamic). Here’s a series of videos that outlines each one. Watching those is also like a time machine of RTS training videos, as you see everything from when I was shooting and editing on my own to where they’re at today! After a while, many of my clients/athletes assume dead bugs are easy and want something more challenging. So just like I use the bear to upgrade the standard plank, I’ll often use wall press abs to upgrade the standard dead bug. It doesn’t look like much, but adding in that subtle reach overhead makes for a much longer lever, and thus, a more difficult core training exercise. When I got started in the coaching world, everyone was focusing on “feeling” muscles. Then, we went through this phase where everything had to be external and focused on the movement – and sensation was ignored. But here’s a dirty little secret: There’s a time and a place for sensation! Plus, many clients and athletes want to feel something in their workouts – it’s part of the psychological buy-in of training. Ab wheel rollouts definitely check the “sensation” box, albeit in a different way. While you can definitely feel the correct muscles while doing the exercise, furthermore, you tend to feel them for a few days afterward as well! Last but not least, suspension trainer core exercises not only put the core on the blast, but the shoulders and upper body as well. These exercises aren’t for the faint of heart, and make sure that both the core and shoulders are up to snuff before giving them a run! Now that we’ve covered a bunch of different core training exercises, let’s discuss a few key points that I feel are critical to getting the most out of your core training. First off, many clients and athletes struggle with balance between their lats and their abdominals. Sure their abs might be “strong” (whatever that means) – but it doesn’t matter if your lats are stronger! In this video, I break down how the lats and abs are in a constant battle with each, and young Danny demos the kettlebell pullover in an effort to help improve balance across the pelvis. I don’t know about you, but I preached “belly breathing” for at least a year or two. Luckily, I wised up and realized that while diaphragmatic breathing is of critical importance, pushing all that air directly into your belly isn’t the best thing! In this video I talk about why belly breathing alone isn’t the answer, and clue you in on some strategies to get air moving in all the right places. While most people wouldn’t classify half-kneeling exercises as pure “core training” exercises, in most respects, I think they’re every bit as valuable as the isolated stuff. In half-kneeling, you get to work on balance across the front side of the pelvis – to inhibit the hip flexors, while turning on and engaging the abs. Whether you train desk jockeys or elite athletes, I guarantee you can get more out of your half-kneeling exercises. Watch this short video to see how to dial in both set-up and performance, along with a handful of my favorite exercises. This video might seem eerily similar to the above, and for good reason! Stiff hip flexors can be really problematic – whether it’s a stiff, achy back or an inability to extend the hips, improving hip extension is a critical piece of the puzzle. Now I’m not going to sit here and tell you to stretch your hip flexors into oblivion, because quite frankly, it won’t work. But as part of a comprehensive program that works on improve core stability, better breathing mechanics, and a holistic program designed to improve movement quality, I do think hip flexor stretching can play a role. And the best part? You can literally do this stretch anytime and anywhere. Enjoy! So there you have it – a ton of different exercises and thoughts on dialing in your core training and improving core and pelvic stability. Whether you coach elite athletes or the gen pop, I guarantee there’s something in here that you can take and use today that will make you a more effective trainer and coach. I hope you enjoyed it, and have a great day! P.S. – Want a resource that covers all of this – and more? If so, consider picking up a copy of Complete Core Training! P.P.S. – It’s not about core training, but if you’re a trainer or coach you might be interested in my Coaching the Lower Body Lifts workshop in May. Click here to learn more! This is an unbelievable share. Thank you, Mike! Thanks Bill – appreciate the kind words!